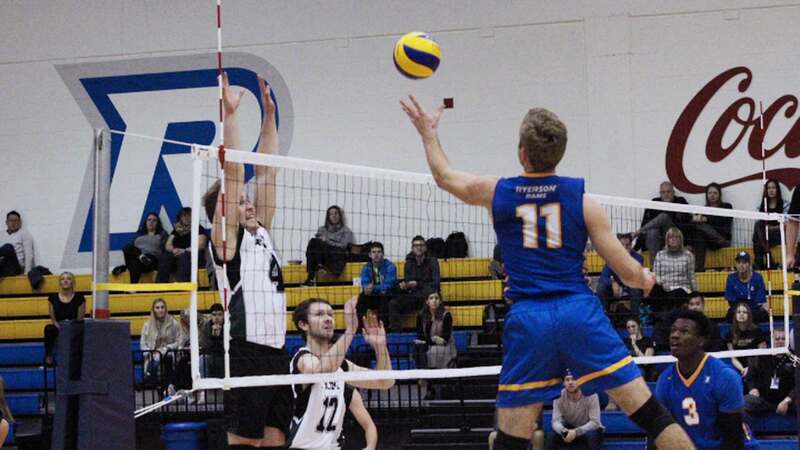 Ryerson’s men’s volleyball team extended its winning streak to a season-high three games with a 3-1 (25-21, 25-22, 19-25, 25-18) win with a against Trent Excalibur at the Mattamy Athletic Centre on Friday night. It was the second home victory in as many nights for the Rams after beating the University of Toronto on Friday night. First-year outside hitter Taylor Jordan had a game-high 16 kills, setter Adam Anagnostopoulos had 48 assists and libero Anthony Cicchi added 11 digs. With the win, Ryerson improves to 6-3 and secures first place in the OUA East heading into the winter break. The Queen’s Gaels will have a chance to match their record for first place when they take on the York Lions on Nov. 26, but the Rams own the head-to-head tiebreaker thanks to a road win in Kingston in early November. The Rams beat an Excalibur team that now sits in dead last in the OUA East with a 0-7 record, Excalibur, a team still getting used to competition in the OUA after spending 12 seasons in the Ontario College Athletic Association (OCAA), was able to put up a decent fight on Saturday night. They won the third set after the Rams forced themselves into 10 errors; the most costly one came off a missed serve by rookie Johnny Lin, an error that cost them the set. Even with the Rams making mistakes, they looked like the more experienced team, finishing with 16 more kills and 3 fewer errors than the Excalibur. After a disappointing third set, they were able to bounce back and win the fourth set by their largest margin. UP NEXT: The Rams won’t play again until 2017, when they visit the York Lions on Jan. 14 at 2:00 p.m.